I've been out photographing quite a bit the past few days. The light has been perfect, bright and overcast. Spent a few hours Tuesday walking the neighborhood near 29th and Friendly in Eugene. Then Wednesday and Thursday I was in Portland for a grid meeting and spent most of the daylight hours roaming the new grid. This is an area roughly between Burnside and Division west of SE 32nd, really the heart of Portland physically, culturally, and demographically. I lived for years in this grid and then close to it, and biked through it every which way on my way to and from downtown. It's probably the area of Portland I know best. Photographing it presents a quandary. Since the area is so familiar, it is hard to find new scenes. Yes, it is possible to rephotograph the familiar but I rely on the charge of newness to inspire me to keep poking around corners. So I spent quite a bit of time in Ladd's Addition, which I think has the best alleys in Portland. The streets are a labirynth of odd angles. Almost possible to get lost in there, and everything is new to a lost person. The other way I found to make the area new was to take lots of portraits, something I've been trying to do more of. I need to get in the right frame of mind. I'm a quiet person and it's hard at first but once I ask a few people the mood is set and it's easier to approach people. Each time I ask someone it's like opening a new door. Each person is a little unknown universe. I don't know how they will react, or how I will react to their reaction. I don't know how the photo will look. I don't know what face they will show me. Above all I don't really know what I'm doing. I have so little experience with portraiture that each photo is an exploration. I certainly haven't developed any style or expected way for the photo to look, which is a problem I sometimes experience in my normal photogaphy. All I know is that the people in this grid generally look intesting. The portraits I shot on medium format. For the rest of the grid I found myself using the Hexar. After the grid meeting some of us went to a bar and George revealed that he hates portraiture, which was something of a surprise since George and I generally have similar taste. He hates Avedon and thinks In the American West is overrated, and something like Gus Van Sant's 108 Portraits is just plain garbage. His expression as he told me this would've made a great portrait. 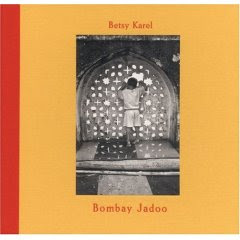 Just east of the grid at Powell's on Hawthorne I stumbled on a wonderful book of photographs, Bombay Jadoo by Betsy Karel. This book is an absolute gem, black and white street photos of Bombay straight out of the mold of Henri Cartier-Bresson or Helen Levitt. The photos looked like they could've been taken 50 years ago when street photography was not yet ironic, before it had been revamped and turned inside out by Friedlander and Winogrand. But they were taken in the past 5 years. The composition, spacing, timing is excellent. I think the reason I found this book impressive is twofold. One is that as someone who attempts to take similar photos I know how hard it is to get these shots. There are a million ways to screw up a photo and only one way to get it right. You can be slightly in the wrong spot, or the wrong arm part could move unexpectedly or a car could drive ino the background or you might misexpose or get camera shake or, or, or.... Most photos I take, and I'm sure most photos that Betsy Karel takes, have something wrong with them and they never get shown to anyone. So each one that made it into the book is a minor miracle. It's like the one in a million sperm which fertilized the egg. And unlike many books which seem akin to spraying zygotes in all directions hoping that something sticks, this one only shows us the successful fertilizations. The other reason I love this book is that it reaffirms my love of b/w street photography. Street photography is somewhat of a dying art, running counter to most trends in the fine art photo world. So it's great to learn Karel made these recently and that there are still folks out there mixing the ancient arts. I enjoy all sorts of methods and styles and have toyed with many in my own photography. But when I see a book like this it reaffirms my first true love. There is nothing which grabs me like a well done b/w street photo.